(2018-10-25) When Installing The Azure AD Password Protection DC Agent Generates An Error « Jorge's Quest For Knowledge! If you are installing the Azure AD Password Protection DC Agent on an RWDC and you receive the following error…. Action ended 16:30:01: BPL_CheckForNonUpgradeableApps. Return value 3. Action ended 16:30:01: INSTALL. Return value 3. In plain English this means you are trying to install a newer version on top of an version that cannot be upgraded. Check the versions. The old version here was installed by means months ago when I participated in the public preview. Today I wanted to install the officially released version and had forgotten the old version was still installed. The solution here? Uninstall the old version first and install the newer version. After both the uninstall and the install a reboot of the RWDC is required. 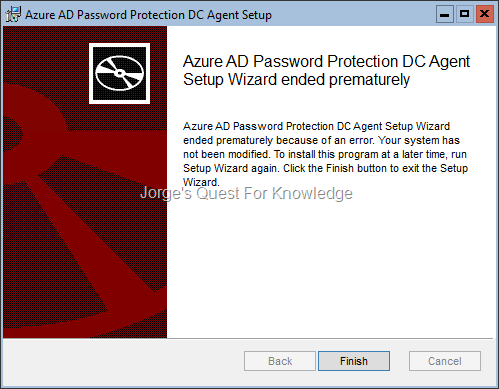 WMIC PRODUCT GET NAME | FIND /I "Azure AD Password Protection DC Agent"
$product = Get-WmiObject -Class win32_product -Filter "Name like ‘Azure AD Password Protection DC Agent’"
$product.Uninstall() # WARNING: Reboot is immediate, no mercy and no questions asked!!! This entry was posted on 2018-10-25 at 22:00	and is filed under Azure AD Password Protection, Windows Azure Active Directory. You can follow any responses to this entry through the RSS 2.0 feed. You can leave a response, or trackback from your own site.